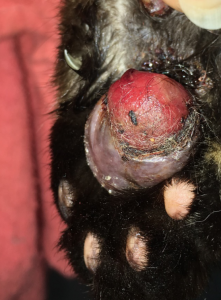 Transmission or Cause: Plasma cell pododermatitis is an immune mediated disorder which causes soft swelling, deformation and sometimes ulceration of the paw pads. Affected Animals: Plasma cell pododermatitis most commonly affects adult cats of any breed, and rarely affects dogs. 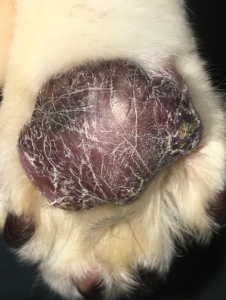 Clinical signs: Paw pads become swollen and lose the normal shape; overlying paw surface may become scaly and in severe cases ulcerations can occur, causing the underlying pad tissue to protrude and sometimes become secondarily infected. Cats often don’t show any signs of lameness or discomfort unless ulceration occurs. The large metacarpal and metatarsal pads are most commonly affected but toe pads can also be affected. Lesions may involve one to multiple paws. Rarely, the haired top of the nose can become swollen as well. Diagnosis: Made by considering clinical signs and history; needle aspirate of a swollen paw pad can reveal plasma cells; the definitive diagnosis is made by biopsy and pathology analysis of a swollen pad. In some cases, plasma cell pododermatitis may be triggered by, or associated with, an underlying systemic inflammatory disease such as viral infection, severe stomatitis (Inflammation of the gums), or even allergies. Affected cats should have bloodwork to screen for possible concurrent disease such as kidney disease or feline immunodeficiency virus. 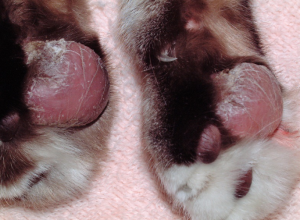 Treatment: Treatment of plasma cell pododermatitis is with medications to calm down the immune attack of the paw pads. Oral doxycycline is often helpful, as this antibiotic has anti-inflammatory effects on the immune system; cats need to be dosed with care to avoid esophageal injury due to doxycycline pills sticking in the esophagus; hide pills in a pill pocket or follow each dosing with a tablespoon of water to wash the pill down. In severe case, immune suppressive therapy with steroids or cyclosporin may be needed. Antibiotics may be needed for secondary infection, and surgery may be needed in severe cases in which ulceration has caused the underlying pad tissue to protrude and become damaged or infected. Prognosis: The prognosis for plasma cell pododermatitis is good; in many cases medications can be tapered off and be discontinued after a few months, though in some cases prolonged treatment may be needed to prevent relapse. Chronically affected cats may not regain the normal paw pad shape or appearance, and pads may appear “deflated”. Prevention: There is no known prevention for plasma cell pododermatitis, though good dental care and prevention of exposure to infectious diseases may be helpful.